Split EMI Suppression Core (CF Series) consists with a nylon plastic case and two half ferrite cores. It can be clamped on cable easily so don’t need cut the existing cable firstly and can be removed from cable without damage. Due to this feature, Split EMI Suppression Core (CF Series) can be installed after assembly products to suppress high frequency noise from cables and save the time before marketing. Shield cores (RH series) and Toroidal cores (T series) are the EMI suppression cores with ring shape, to suppress high frequency noise from cables. RH cores are usually used for the cable assembly with plastic injection molding. The smaller RH cores are usually used to pass through beads of other elements or to be inductors by passing through wire. The T cores are mainly used for common mode or differential mode filter to suppression EMI. If the design need higher impedance, increase the wire turns through the core is a fast and easy solution. The core (FH Series) is used in D-Sub, a connector for data transmission devices, to suppress the electromagnetic noise through the connector. FH series have 9, 15, 25, 37 holes and others design, can be insert the connector easily. Flat Cable Suppression Core (RP Series) is a EMI suppression core with flat shape. It’s mainly used for the flat cable like FFC (Flexible Flat Cable) or FPC (Flex Printed Circuit) to suppress the electromagnetic noise through the cable in electric equipments. Due to this flat design, this ferrite core can be located in a narrow space inside the equipment very easily. 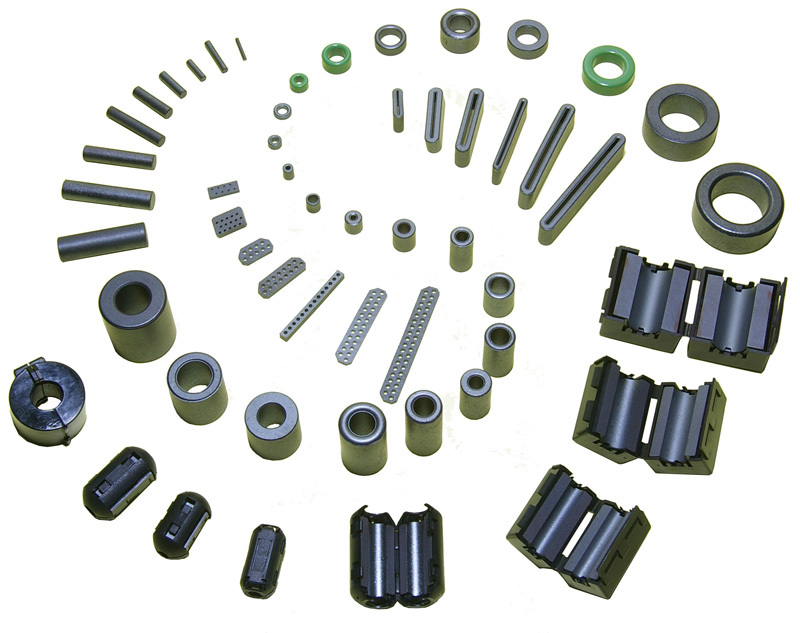 Ferrite Plate core (FP series) is one EMI suppression core with flat plate shape. It can suppress radiation noise from microprocessor when attached on the microprocessor, prevent resonance and suppress coupling when attached two microprocessors, suppress the electromagnetic noise through the cable from electric equipments when attached on the flat cable like FFC (Flexible Flat Cable) or FPC (Flex Printed Circuit). Also, it can avoid the NFC (Near Field Communication) mobile phone performance reduced because the battery, and restrict the magnetic fields occurred respectively from wireless charger base station and mobile device to protect others equipment. Ferrite Rod Core (R series) is a cylindrical ferrite core, can be easily assembly with a spring coil or wind wire directly. It's widely used for radio antenna, LF/HF RFID antenna, choke coil, inductor, DC power filter, DC signal filter and transformer. Due to the open magnetic structure, the core can accept large DC bias before saturate.